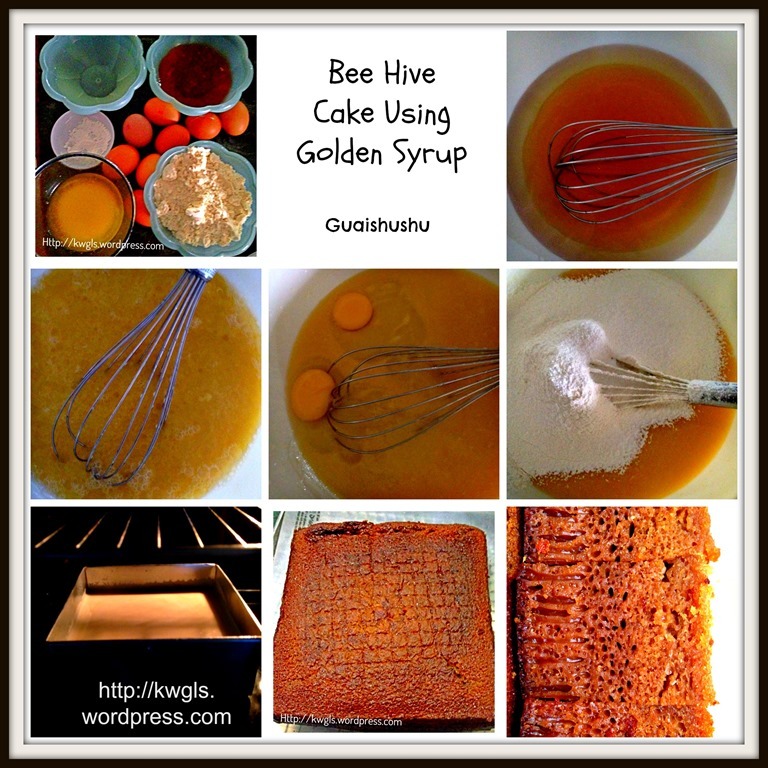 Please take note that there is an updated recipe of using golden syrup instead of caramelizing the sugar. 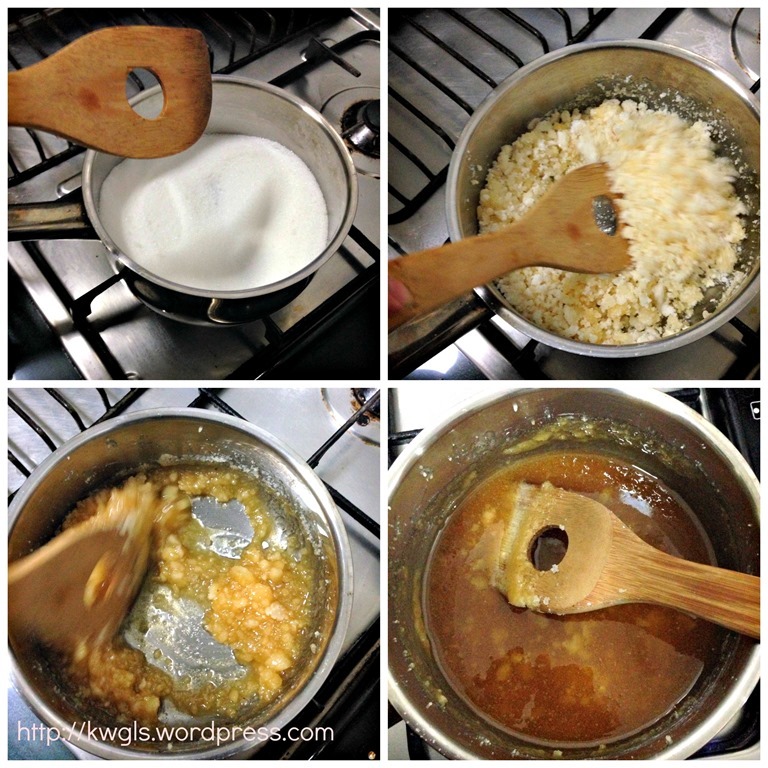 So Recipe 1 is the traditional method of caramelizing the sugar and Recipe 2 towards the end of the post is using golden syrup. You can choose either one of the recipes. I have repeatedly said this many times, in the 1970’s and 1980’s, all traditional cakes and cookies recipes in this region are rather simple, using simple ingredients, simple cooking method and baking equipment. This is a childhood cake. I remember very clearly that my I first tasted the cake 35 years ago prepared by my eldest sister in law. Then, she just “befriended” with my eldest brother. We did not have any oven, no mixer or even measuring cups. 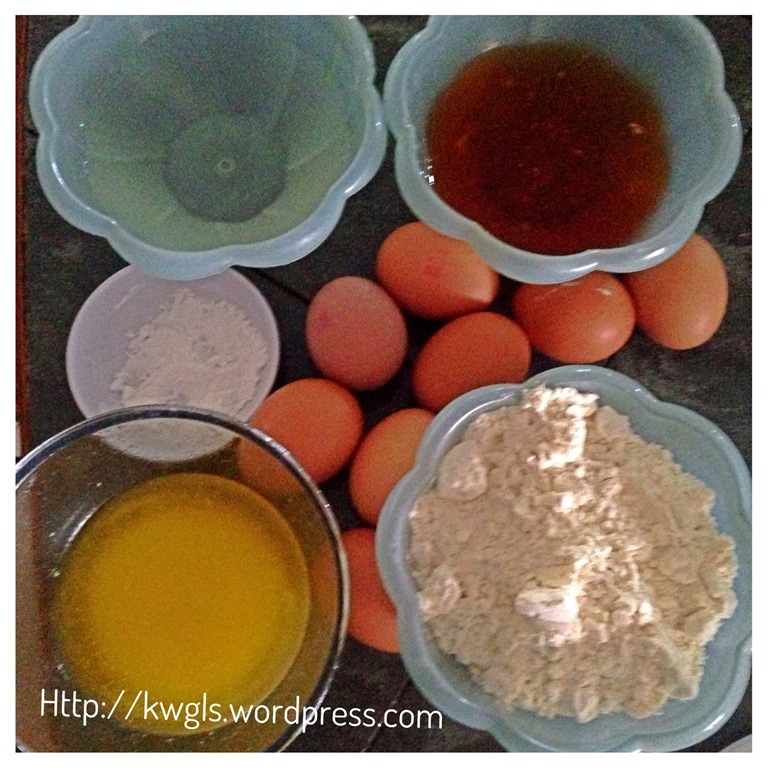 What she did was using the simplest mixed and steamed method to prepare the cake. I can only recalled it as a moist, dark colour, spongy cake. 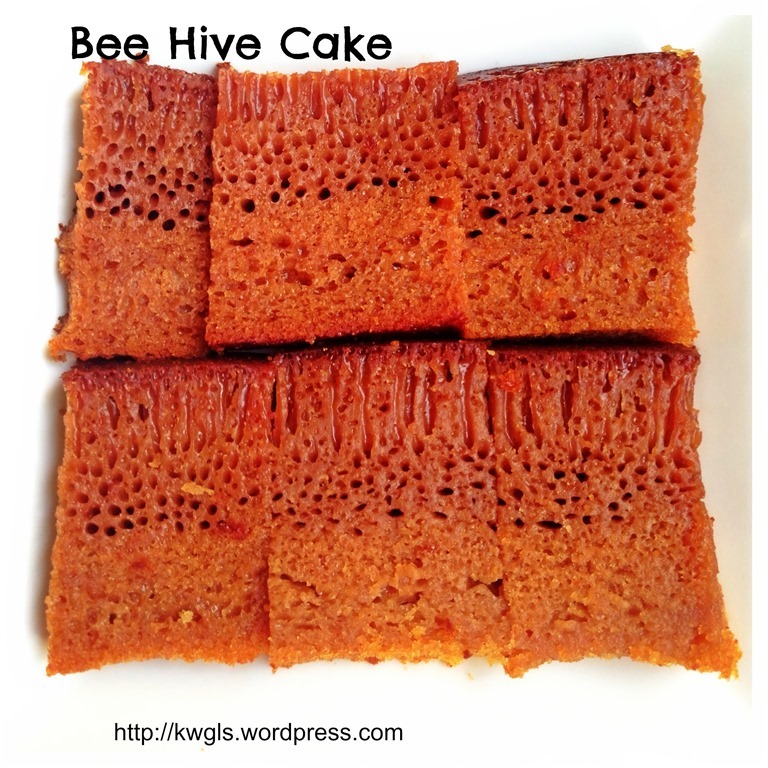 The cake is called honey comb cake or bee hive cake or kek sarang semut (literally translated as ant’s nest in Malay Language). 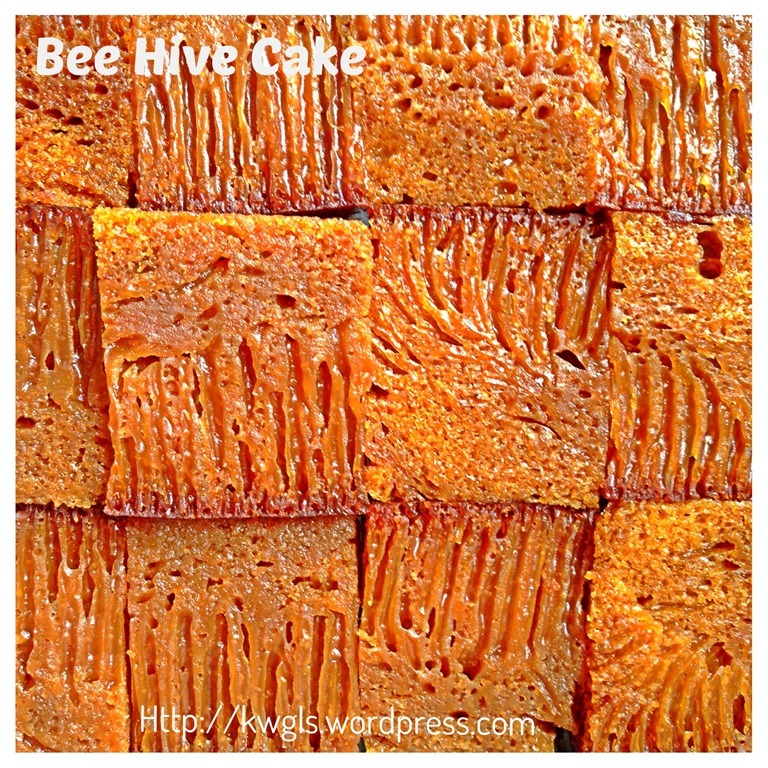 Some may misunderstood the cake as Bingka Ambun, another Indonesian cake that have a bee hive cake structure. However, they are different. In fact, I have suspected another Chinese cake, white sugar steamed cake (白糖糕）is also related. I honestly believed that these 3 cakes are interrelated, at least from the aspect of food histories. 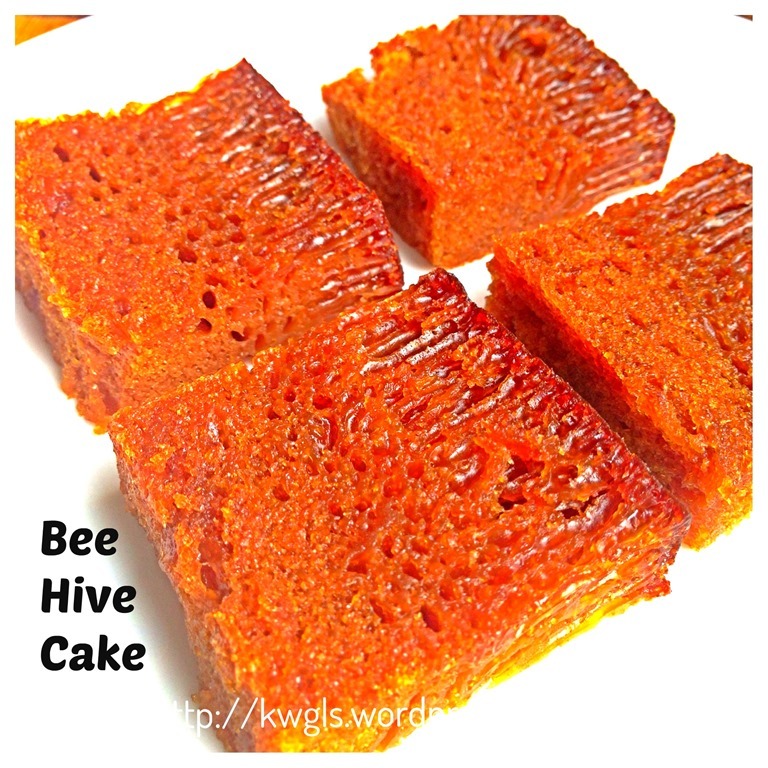 All the 3 cakes have some common cake characteristics, an “airy” bee hive like structure and spongy cake texture. I like the cake, so is my wife who is also from Sarawak. She told me that she craved for the cake a while ago and we cannot buy it from Singapore bakeries as it is definitely not a common cake. Months ago, I have tried one recipe from the internet but failed terribly. Since then, I have not tried any other recipes until the New Year Eve 2013. On that day, I invited my brother’s family to have dinner with us. 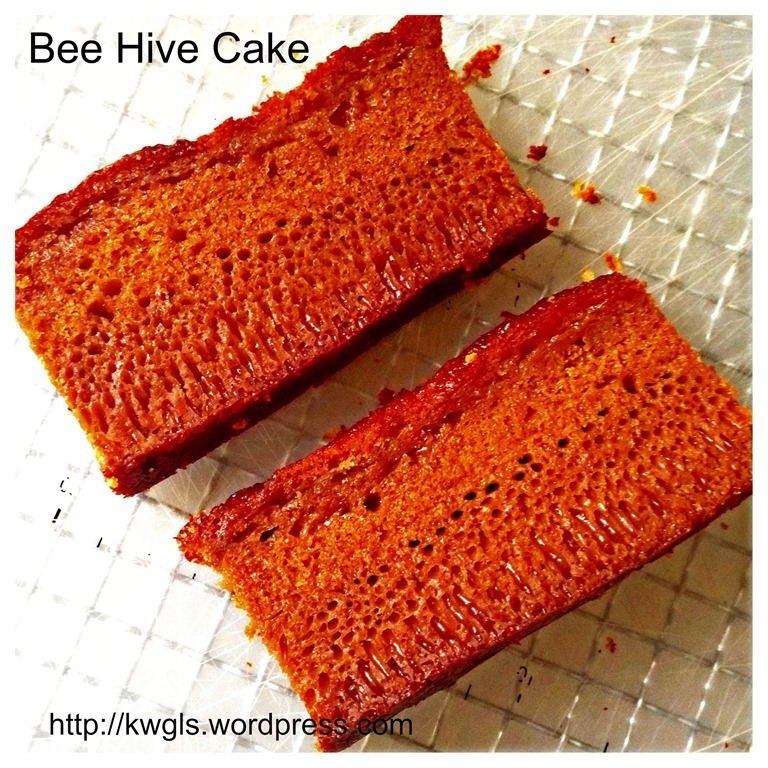 After the dinner, my sister in law and I talked about the bee hive cake that she prepared about 35 years ago. 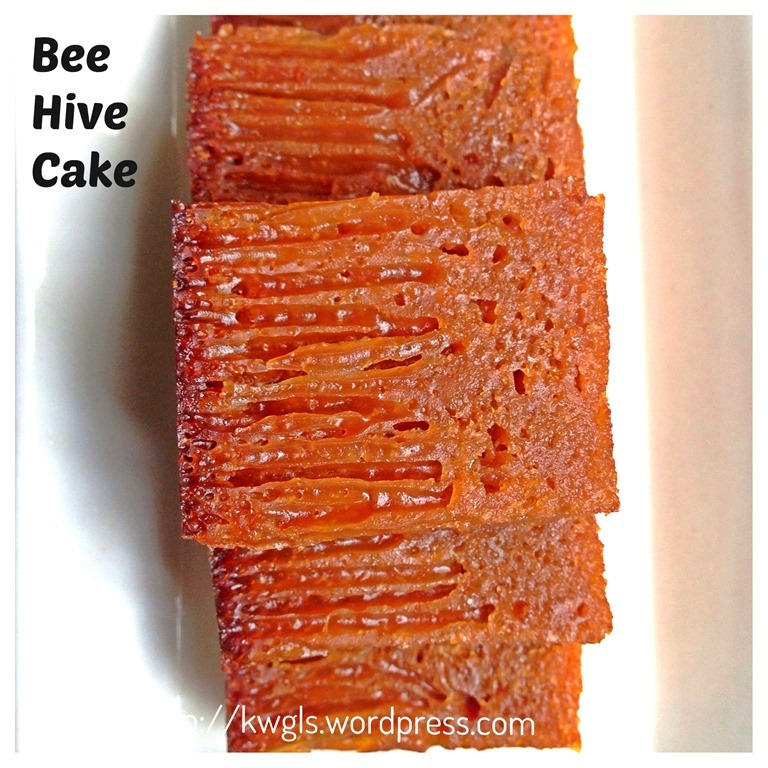 Based on her memories and what she had described, we managed to come out this bee hive cake. All are using simple measurements such as 1 can of condensed milk, 2 cups flour, 2 cups sugar, 2 cups water, 8 eggs , 1 teaspoon of baking soda … etc. I am very happy to have successfully bake this cake even though it is slightly burnt on the top as she can’t really recall the correct temperature (note that at her time, she is using the simplest movable oven or steaming). Lightly grease a baking tin and pre-heat the oven to 160 degree Celsius. In a sauce pan, heat the sugar under medium to low heat. Continue stirring until all the sugars have melted. You have to be patience. If you use high heat, the sugar will be burnt and you have to throw away as it will be very bitter. It will take about 10 minutes but that very much depends on your heat. As long as the syrup have turn light brown, you can off the heat. Add 2 cups of water to the melted sugar CAREFULLY. As this is hot melted sugar, it may splash out. Let the syrup cool at room temperature. If you can’t wait, put the syrup in a pool of cold water to release the heat. In a mixing bowl, cream the butter slightly. Add in 1 can of condensed milk, beat until well combined. Add in one egg at a time and beat using slow speed until well combined. Repeat the same until all the 8 eggs are added. Sift in the flour, use slow speed to stir until well mixed. Add in the COOLED syrup and baking soda to the batter, stir until well combined. Transfer to the baking tin and bake in the pre-heated oven at 160 degree Celsius for 45-60 minutes or until a skewer inserted comes out clean. Let it cool completely before cutting into desired sizes. This is another traditional verbal recipe that turned out to be a success. I have been looking for this recipe for a long time but none is as easy as what my sister in law had shared with me. I appreciated traditional verbal recipe and I must document down and keep it as a record before every body forget about it again. Sponginess, soft, moist, buttery with mild caramel aromas are the characteristics of this simple cake. Trust me, it is not as sweet as you think it should be. The sweetness is just nice for an average sweet tooth. Subsequent to my issuance of this report, a number of readers are trying out the cake. Some of them are getting the beautiful patterns and some of them only get minimal holes and one reader is complaining about the bitter taste of the cakes that she prepared every time. The bitter taste is most likely due to the burnt syrup in the cake. Note that in the above method, as long as the syrup is lightly brownish, you have to off heat immediately, otherwise it will be burnt and become very bitter. Because of this, I have decided to bake another cake on 12 January 2013. by using ready made golden syrup instead of caramelizing the sugar our self. In fact, I have to admit for the preparation of this cake, I hate the syrup preparation process as it is quite time consuming and it will splash if not careful. 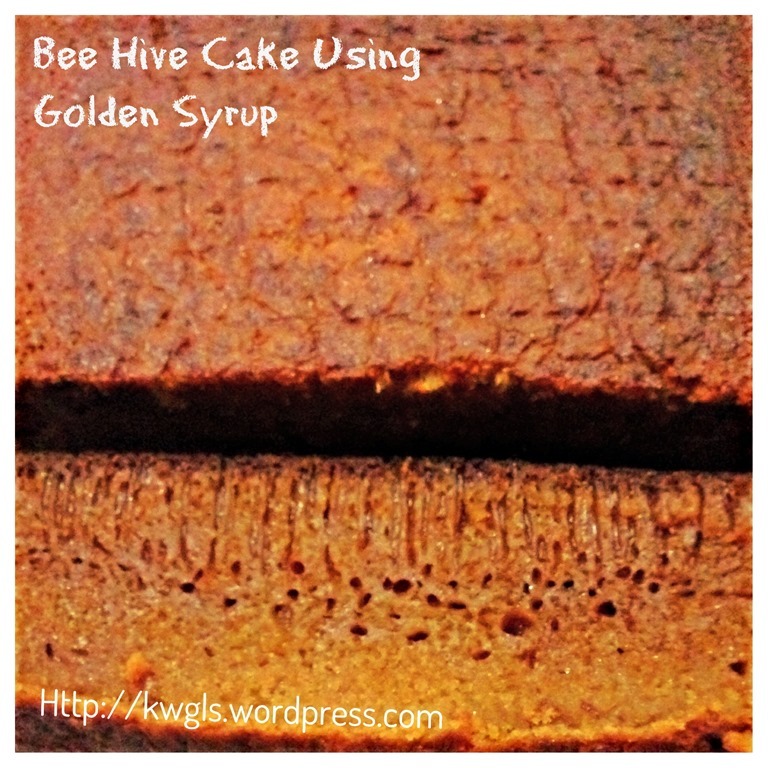 With the use of golden syrup, the procedures, the water amount and other measurements have to be amended accordingly. Mix the golden syrups with the water. Stir until dissolved. 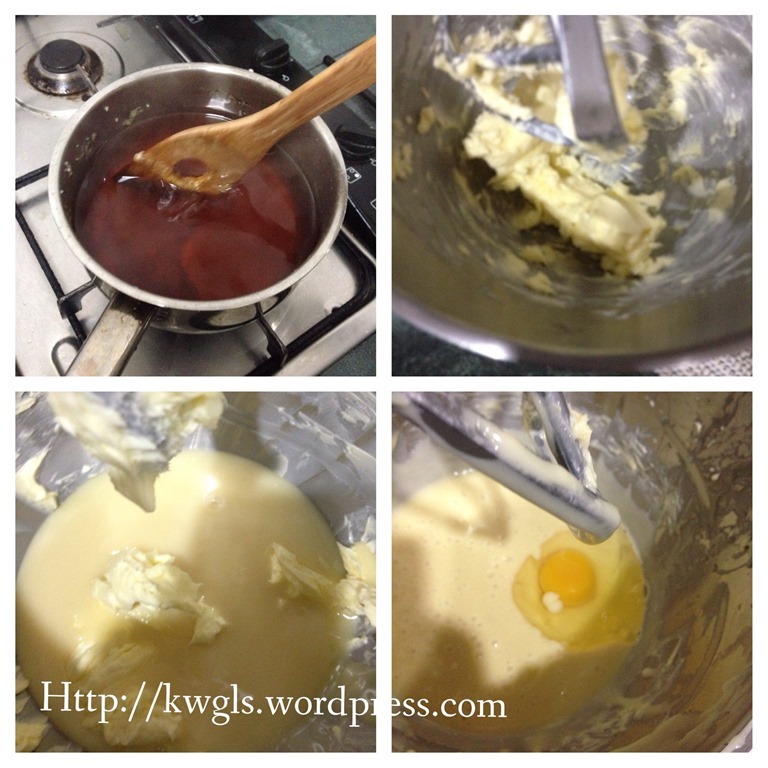 Add in condensed milk, melted butter and eggs, stir until well mixed. You can add in stages. Sift in the flour and baking soda, stir until well mix. Transfer to the baking tin and bake in the pre-heated oven at 160 degree Celsius for 45-60 minutes or until a skewer inserted comes out clean. Let it cool completely before cutting into desired sizes. For more recipes, you can refer to myRECIPE INDEX here and you can follow me at PINTERESTor visit this blog’s FACEBOOK PAGE . If you are a Pinterest user and you are interested to have more recipes, you can join or follow this Pinterest Board set up by me where there are more than 1000 recipes worldwide and pinned by various bloggers:FOOD BLOGGERS AND FOODIES UNITED PINTEREST BOARD. You can also join the Food Bloggers and Foodies United Group Facebook Group to see more recipes. 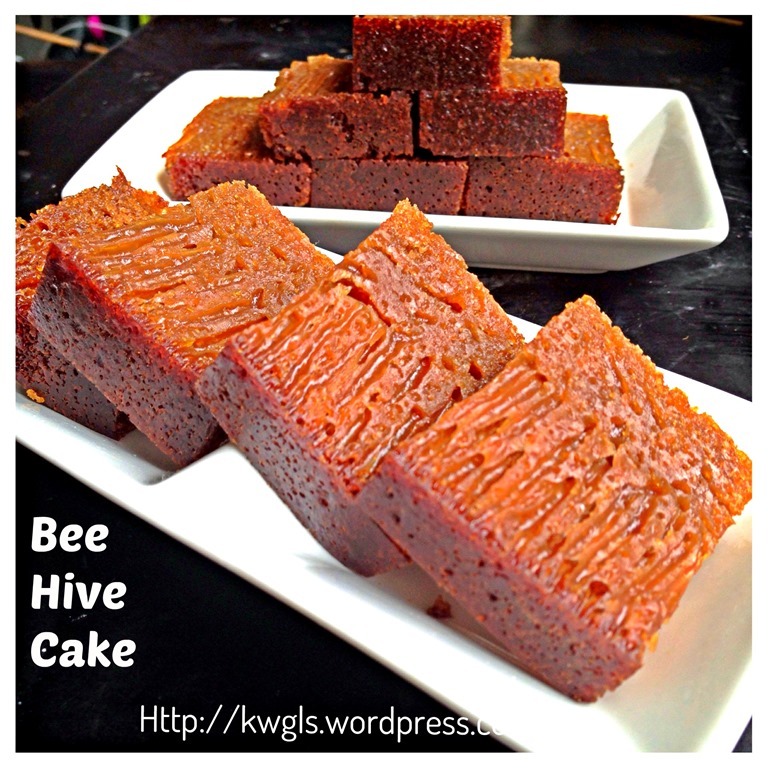 This entry was posted in Cakes and cookies, Chinese and Asian Cakes and Snacks, Chinese New Year 2014, Food Preparation Series and tagged 8, Bee Hive Cake, 蜂巢蛋糕）, GUAI SHU SHU, Guaishushu, kenneth goh, Kueh Sarang Semut, Malaysian Honey Comb Cake, postaday. Bookmark the permalink. Hi, possible to use steam method or this recipe? I found this post so very interesting! I love how you gave a nice history of the cake and I learned a lot I did not know! I have never had this cake but I am looking forward to trying it out sometime! This is a super unique cake! Hi Kenneth. I love this cake. Thanks for sharing your recipe. In most recipes, they leave the batter for 3-4 hrs. I noticed you baked immediately but still has a nice outcome. I will definitely give this a try. Nadia, thanks for dropping by. 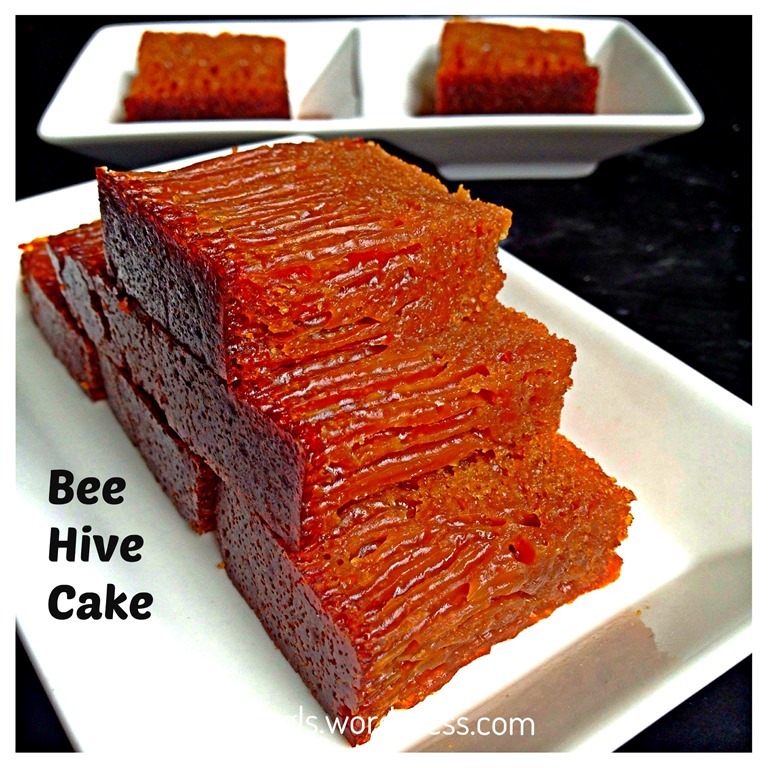 For bee hive cake, you don’t need to prove for 3-4 hours. But for Kueh ambon which uses yeast, they need 3-4 hours. Kueh ambon uses yeast as compared to baking powder. I make this cake last few days..thanks for the recepie hubby n kids like it so much.firstly im a bit worried bcause number of egg is 8 i thought is too much but when done is perfect.i follow the first recepie. Thank you again Kenneth Goh. Sometimes simple is the best! This looks so pretty and so interesting that you were able to duplicate 35 years later! Thanks for sharing! Lovely cake which I like but haven’t come across a reliable recipe. Thanks for sharing. Thanks for sharing Kenneth. 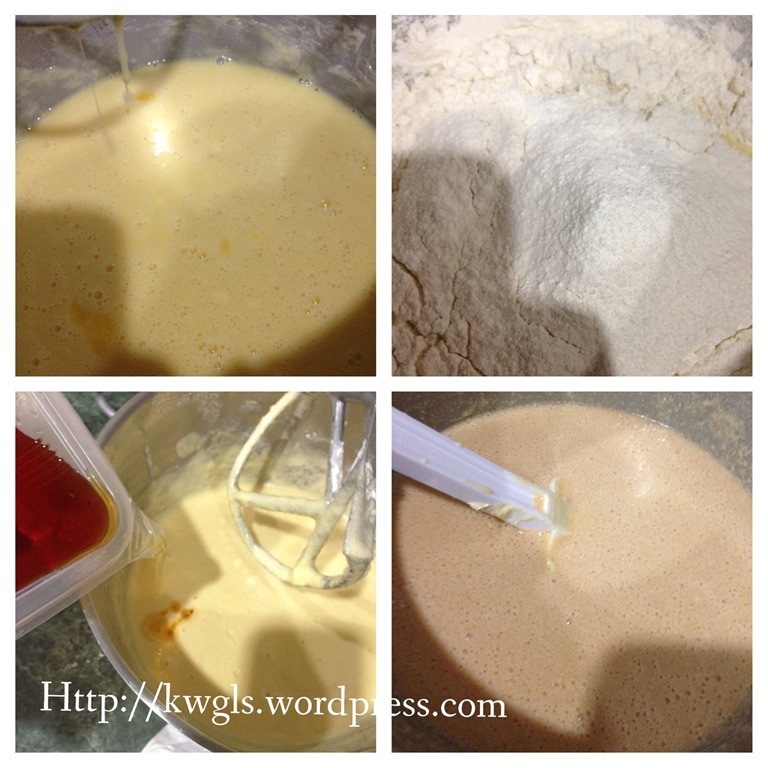 Could you also share how to successful make Bingka Sarang (ambon)? Have tried many times but unsuccessful…lot of failed attempt. 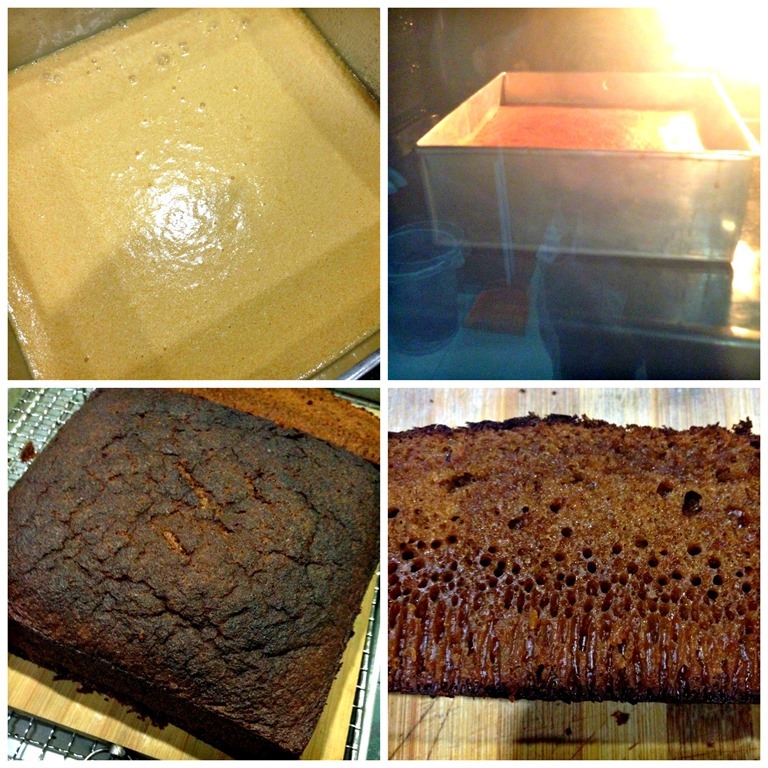 And the smell of the yeast is too strong…please help as Bingka sarang ambon is one of my favorite and it’s very hard to find as most people cant make it successfull too. 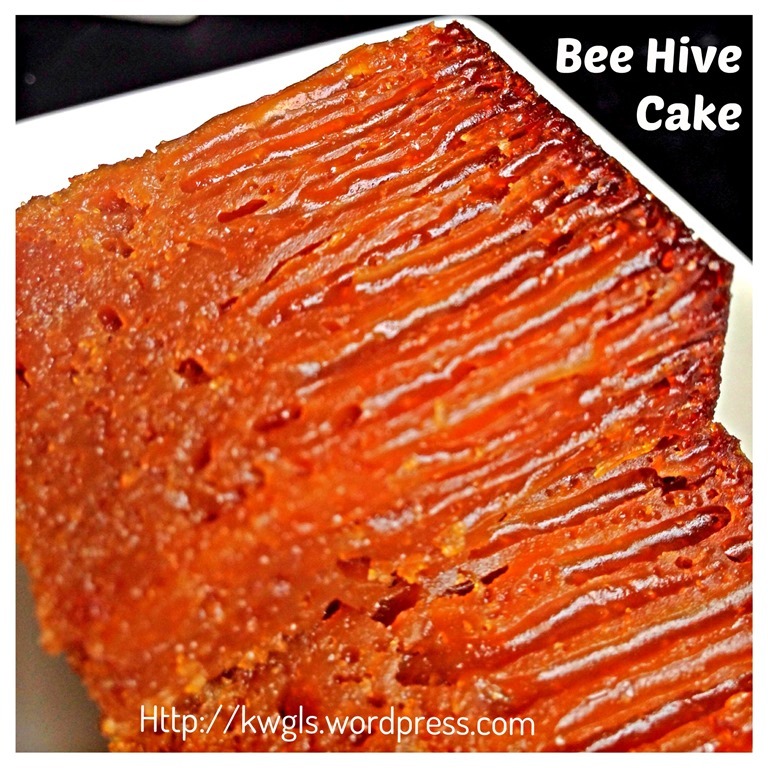 Those that succeed will not share their recipe as they do it as a business…so if anyone can share their success stories on how to bake Bingka sarang ambon, very much appreciated. I will try after new year. WOW! I am totally going to have to try this – never seen anything like it before… I love crumpets and there’s something about those cake columns that make me thing it’s going to be all that’s good about a crumpet, but in cake form! I’ll be saving this one for the near future. Thanks for sharing! Is there a taste difference using golden syrup vs caramelising of sugar? HI I’m from Malaysia Sarawak I remember when I was back there . 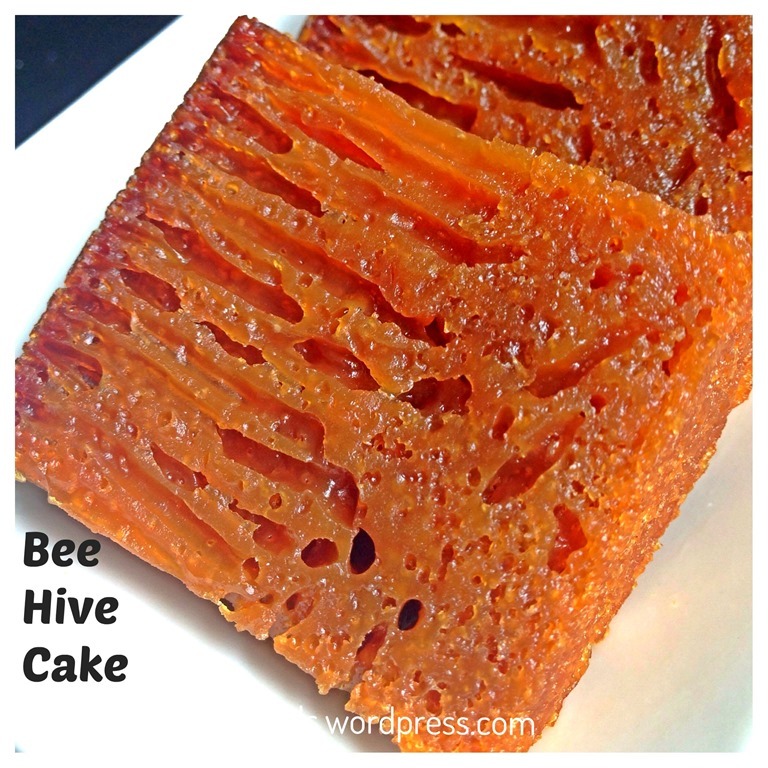 my friend and I always make this Bee Hive Cake every times we try to make them it turn out different.even we go by the recipe most of the times turn out great sometime is not.The last time I make it with out looking at the recipe it turn out perfect. just like the pics you posted. 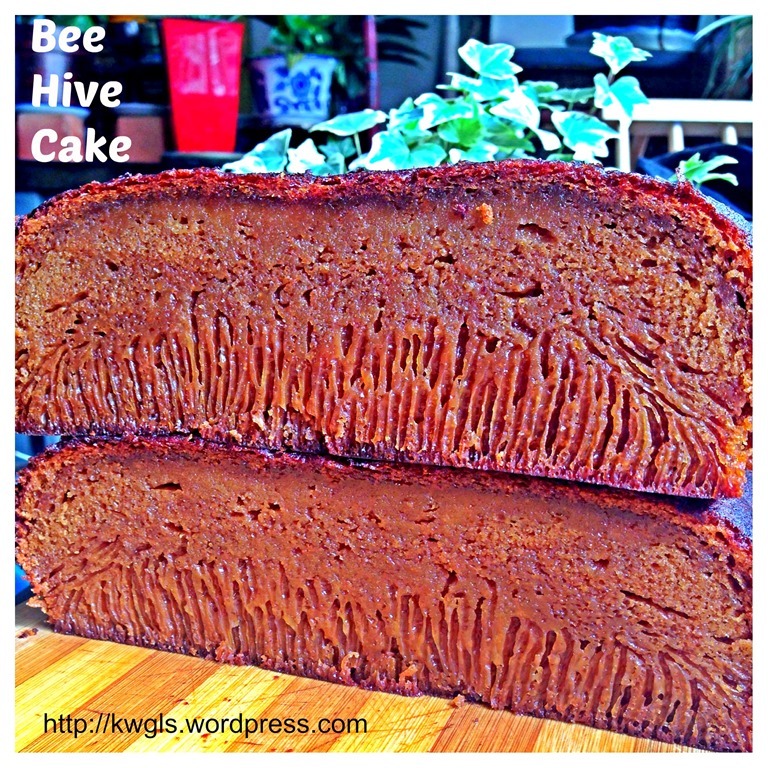 Bee Hive Cake is one of my favored cake I like to make in Chinese New Year’s. I haven’t make this cake for a longtime can find the recipe .Thank you for posting this recipe .now I got it again.and I’m going to make it someday. 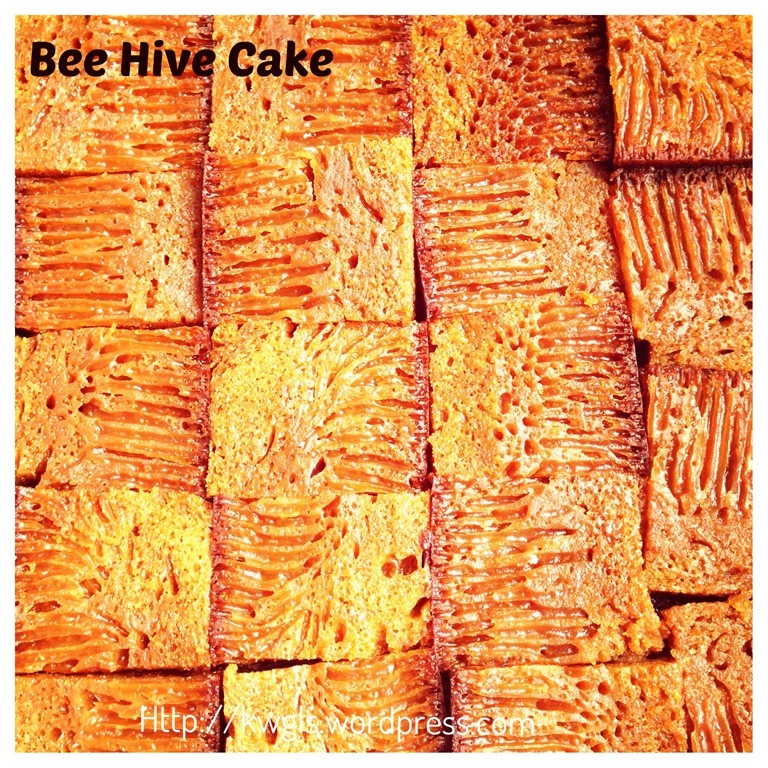 Hi, your post is so interesting and helpful for me wanted to try this cake so much. But may i know must the eggs be cold from the fridge or it doesnt matter. Thanks a lot! Thank you so much for sharing this recipe!! I’ve tried making this cake before but FAILED SO BADLY before. Your recipe has come out with the best result so far… I just wish I could get more “columns” in my cake!! But still very happy because I’ve never managed to get the texture right before. Thank you!! Hi can this recipe be used for steaming the cake? 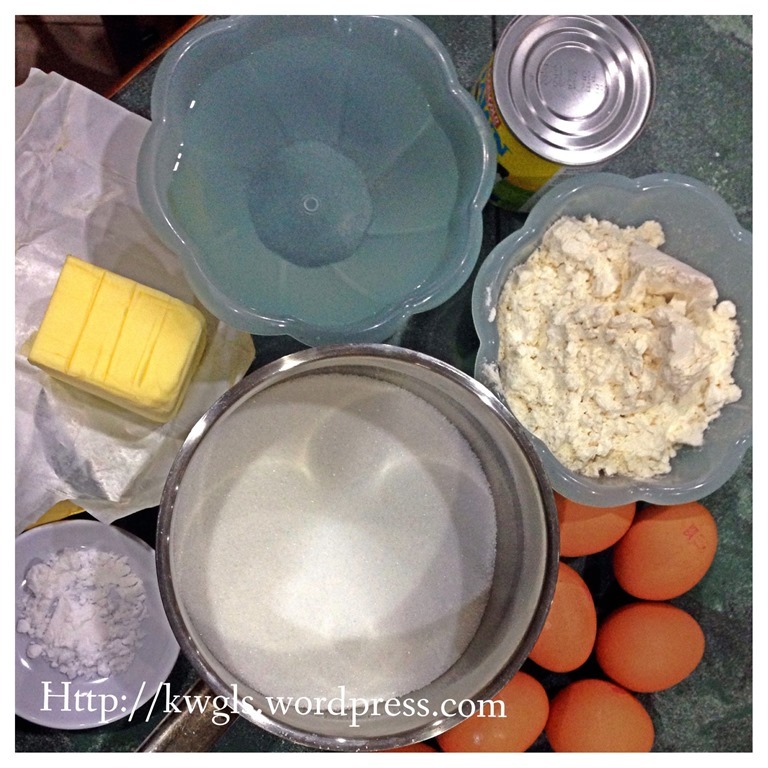 Could you please share the recipe and step by step for White steam sugar cake? Tried it from a recipe but didn’t work and would love it to make for upcoming Raya. Hi Kenneth! The women in my kampung made this when I was around eight years old. Had too much every year for ten years (coz it was easy to steam) that it was not my favorite. After thirty years and not in Malaysia, the memory of it, missing it’s soft springy texture came to mind. Been thinking of trying it but don’t’ have the recipe. Was browsing and found this. After reading through, I know your recipe was the same as what we used. 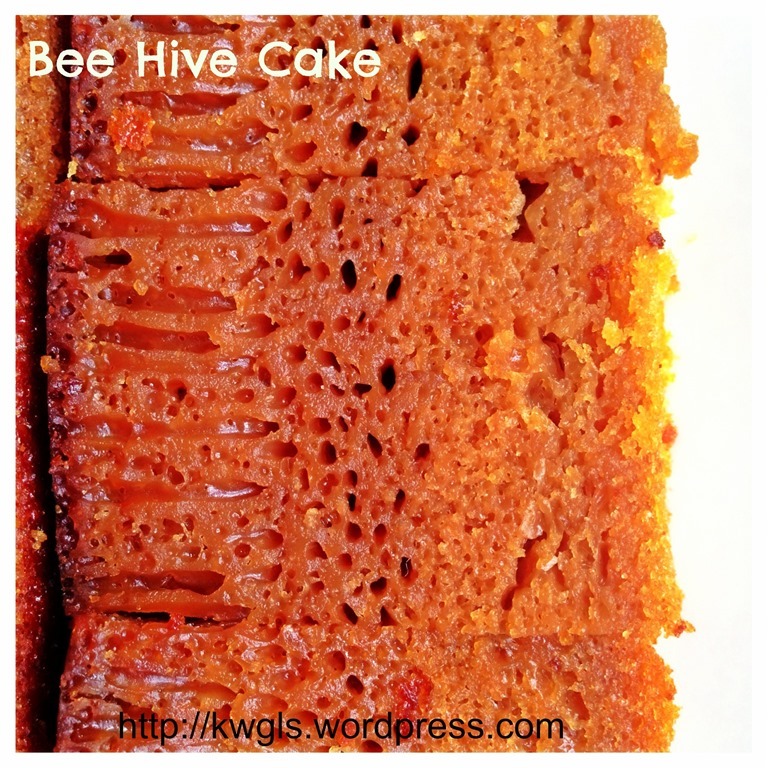 It is soft & moist with steaming as compared to firmer springy texture in baking! Will try this! Thank you for sharing this recipe! Beautiful cake, can’t wait to try this recipe! Thank you for sharing!! Hi, what type of oven are you using? I’ve read that you cannot use a convection oven for this cake, must only use the bottom heating element. My oven allows me the choice to use both top n bottom heating but do not allow me the option of using just the bottom heating. I tried your recipe, using both the top and bottom element in my oven, it turned out nice but I only got the holes but not the tunnels! I think we share the same oven. This is not an easy cake and at times, it do behave rather abnormally. I think heat circulation is very important. By the way, many thanks indeed for sharing this recipe. TQ. What is the measurement of the cup?? As long as the ratio is correct, if recipe used cup, please used cup. Cup usually refers to standard measuring cup. If you do not have, use rice cooker cup, it is the same. i bake the cake today. it looks fine but unfortunately it is extermely sweet! This is a traditional cake, if that is the case, you can reduce sugar by 10-15%. I came from that era and I found it is just nice to go with kopi -o kosong .. 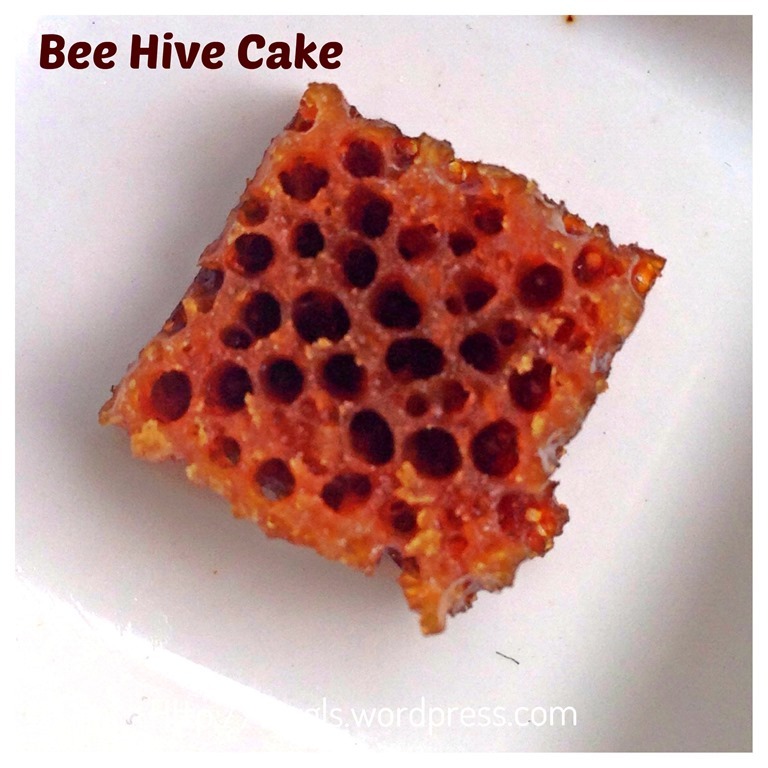 I followed your recipe for the bee hive cake but failed to achieve the holes in the cake. Before baking the batter is watery. Can you tell me what went wrong? This is a delicate cake and so far I have not come across a fail proof recipe. But I suspect it is oven temperature problem. I am also puzzling too as some readers have well structured bee hive whereas some as none. Thank you, Sifu Ken, I baked today . The aroma and taste is good. Except there was not so much holes! Will have to try again. Thanks for the recipe.